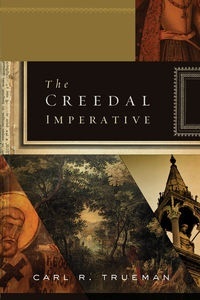 An excellent post from Scot McKnight on a review of Carl Trueman's book, The Creedal Imperative. 2. Confessions delimit the power of the church. (I don’t like the word "delimit" but I agree with his point.) They mean the church has to answer to something above it! That's a good thing. Too many think they are the first to find something. 3. They offer succinct and thorough summaries of the central elements of the faith. Good creeds do this, but here the Confessions are even more thorough. 4. Creeds and confessions allow for appropriate discrimination between members and office-bearers: that is, not everyone has to be the expert; but leaders ought to be theologically informed. I could tell stories…. yuck. 6. Creeds and confessions represent the maximal doctrinal competence the local church aspires to for its members. 7. I like this one: creeds and confessions relativize our modern importance and remind us we are part of a long history and Story! 8. Creeds and confessions help define one church in relation to another-- this is about information not schism. 9. Creeds and confessions are necessary for maintaining corporate unity. I believe in a creedal imperative, and this book can help more and more of us to find a common conversation around our common creeds and confessions. Scot's entire post can be read here.